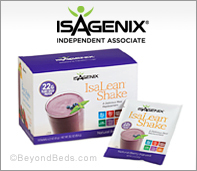 Meal Replacement Shake, Natural Weight Loss Products By Isagenix, Dairy or Dairy-Free, Non GMO, Exceeds USDA Organic Standard. 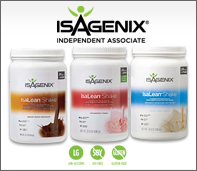 This web page is provided to you by an authorized independent distributor of Isagenix products. Our OBS recommended retailer “BUY NOW” buttons will redirect you to an Isagenix owned website and all products purchased will be shipped to you directly from Isagenix. Isagenix’s does not allow any of their products to be sold through any online marketplace websites, such as eBay or Amazon. Any Isagenix products listed on these marketplaces, through sellers “Fulfilled by Amazon”,“Sold and Shipped by Amazon” or “Sold and Shipped by seller” is unauthorized and strictly prohibited. So a word of advice, don’t risk your health by shopping Isagenix products on Amazon or ebay, you don’t know if the products have been improperly stored or tampered with. We are told, Isagenix is working diligently with their compliance and legal team to get the Amazon and ebay problem fixed. Shopping the lowest price, may end up costing you the most. 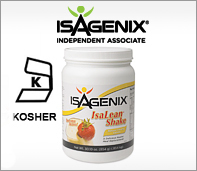 IsaLean Shake is a complete 240-calorie meal replacement, that perfectly blends 24 grams of no compromise undenatured protein, low-glycemic carbs and healthy fats to reduce your caloric intake without depriving your body of much needed nutrition. Fueled by premium Myo-IsaLean Complex™ protein. For less than $3 per meal, IsaLean Shakes provide the highest quality of amino acids and an exclusive source of New Zealand whey and casein protein. Hormone and Antibiotic Free Whey Protein, low-calorie, Flavor Natural Creamy Vanilla.